Patrickswell Brownes: What did the house look like? Tenure Books give information on the property and type of lease for each tenant. House Books add another dimension to the picture we have of our ancestors. They identify the actual footprint of the house and any other building on the tenement, and describe the condition of each building. Together, House and Tenure Books can provide an idea of the prosperity of each family in relation to others in the area. 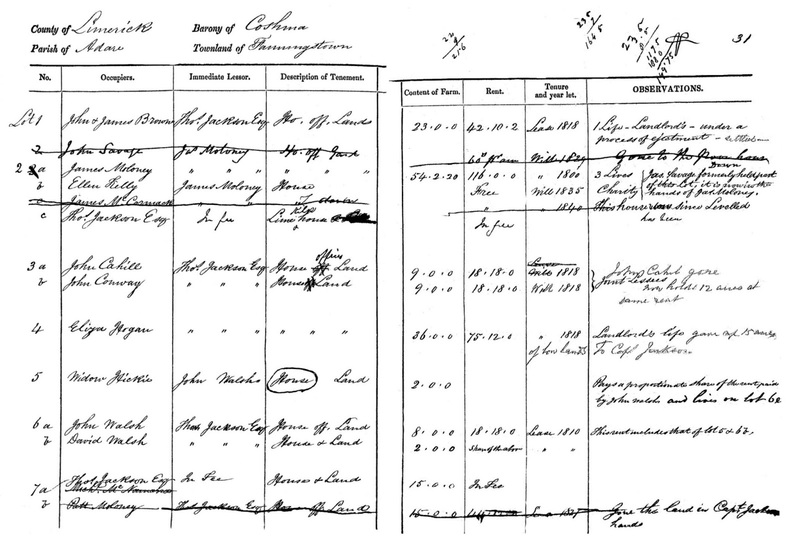 Remember, the Tenure Book indicated the tenancy for both Thomas and Thady (Timothy) Browne was released to the owner in December 1848. (Complete Fanningstown Tenure books are shown at the bottom of the post.) 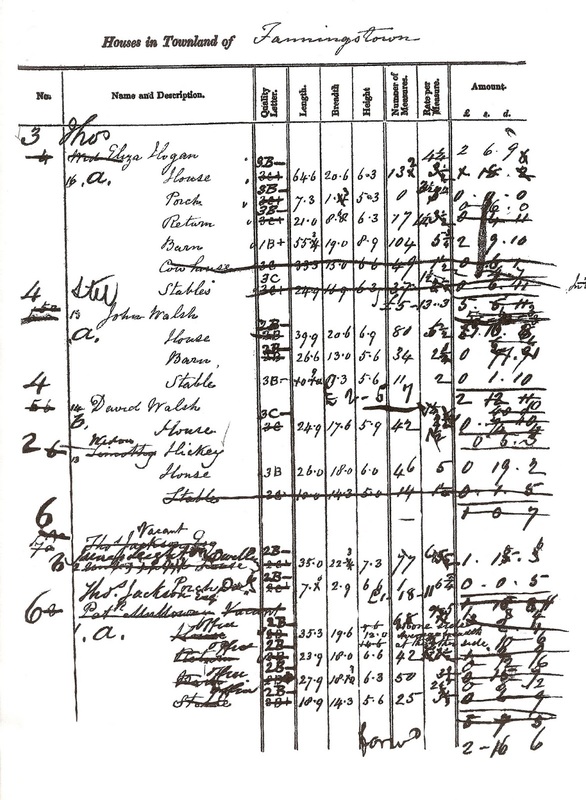 Take a look at the House Book for Thady Brown at the left.1 The entry for Timothy/Thady is at the bottom of the third page of Fanningstowns valuation. It shows Thady Browne scratched out with “vacant” next to his name. 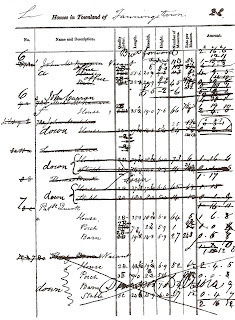 I suspect the house was identified as vacant when the family left and was later demolished since the entire entry is crossed off with “down” written in several places. From the description of the house and other buildings, we get a pretty accurate picture of what the property looked like. The house measured 43.9 feet long and 19.3 feet wide with a porch or wind break on the front. The outside walls (the length of the house) were 6.9 feet high. 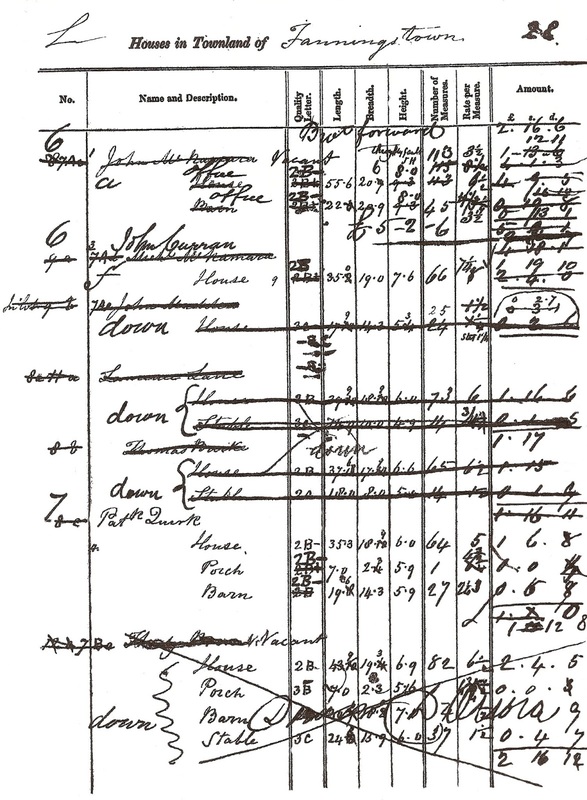 The number in the “Quality Letter” column (2 for the house) indicates the house had stone walls with lime mortar and a thatched roof. While the house was in good repair, it was a second class house of medium age in slight decay. This is indicated by the “B” in the quality letter.2 Included in Thady’s holding was a stable (3C) measuring 24.6 feet long and 15.9 feet wide, and a barn. 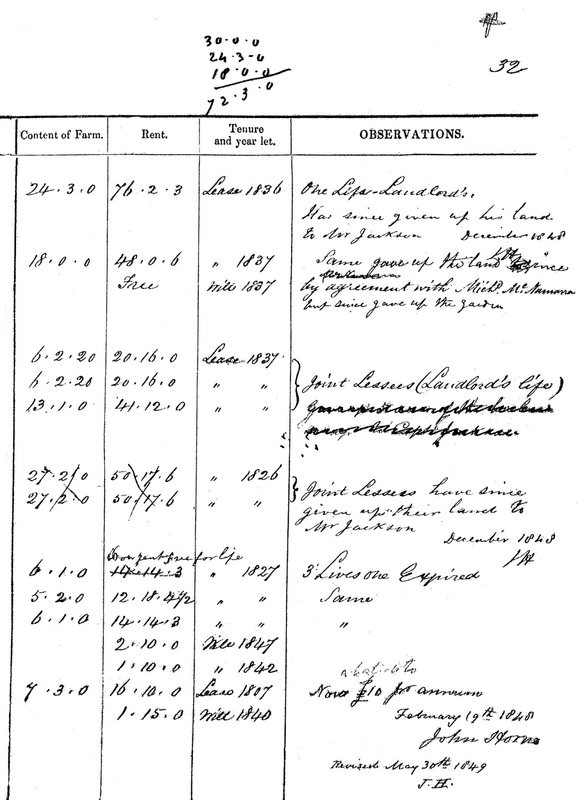 The copy is difficult to read, but, I believe the barn is about 30 feet by 18 feet. A typical thatched house would have had a steeply pitched roof, as much as 50%, to shed water. There would have been a central “living” room with a hearth and probably a room opening to either side with a sleeping loft over one room. Doors and windows were located in the side walls with doors opposing each other in the central room. The width of the house was determined by available building materials. The house shown above right is of an existing house built approximately 1790 to 1810 in County Limerick in Ballymacashel3 less than 10 miles from Fanningstown. It is probably pretty representative of what Thady’s home would have looked like including the placement of the farm buildings. The picture is used with permission of the Irish Department of Arts, Heritage & the Gaeltacht , National Inventory of Architectural Heritage at www.buildingsofireland.ie. They have many other wonderful examples that you might be interested in viewing! The property of John and James Brown4 shown on the first page (first entry) of the Fanningstown House Book would have been similar in size and structure to that of, what I believe is brother Thady. (See copy of House Book to the left.) The house was 42 feet by 20 feet; the barn was 40.9 feet by 18 feet; and, the stable was 28.5 feet by 12.9 feet. These structures also were stone buildings with thatched roofs. 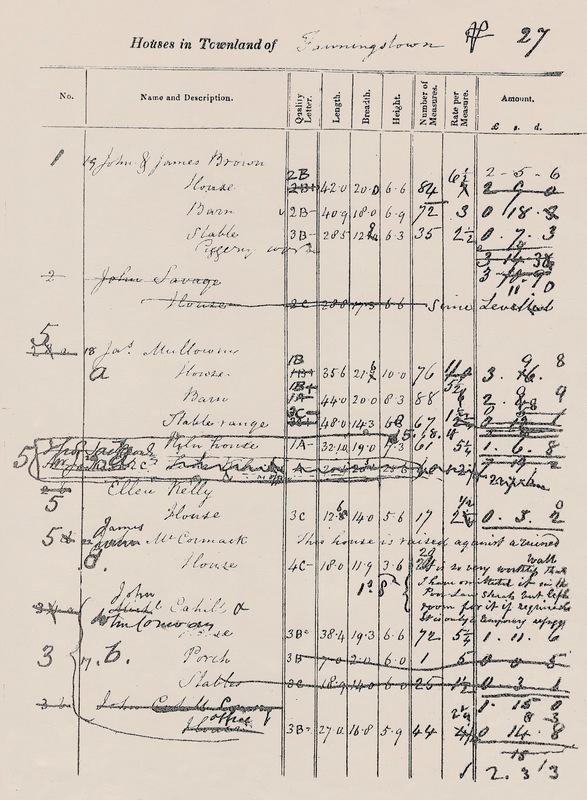 The house for Thomas Browne5 is shown on the fourth page of the Fanningstown House Book. (See copy of the House book to the right.) This property has Thomas’ name crossed off with “vacant” written next to it. It also shows John Madden living in the dwelling. Since John Madden is shown in the published version of Griffith’s with a house rated approximately the same, I believe this is the same holding. It appears the house started out as 43.4 feet by 18 feet; however, the length of the house is crossed off with “15” feet written in. Does this mean the house was altered (part of the structure torn down) or was John Madden living in only a portion of the house? If a portion of the house was not destroyed, then it could possibly have been used for storage or to house livestock, although the House Book does not indicate this. If the property was converted from a dwelling to farm buildings, I think that would have been indicated as is shown for lot 6 at the bottom of page 26 (Last entry on page 2 shown below left). 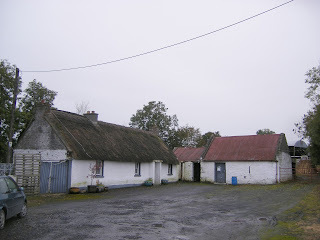 All but three of the buildings in the townland are identified as having thatched roofs. The exceptions are the lime kiln house of Mr. Jackson, the owner of Fanningstown townland, (shown as a “new” structure) and the house and barn of James Moloney (lot 5 on the first page with John and James Browne). The average length of the houses in this area is 35 feet, with most being in the 35 to 40 foot range. Most of the houses are 18 to 20 feet wide. 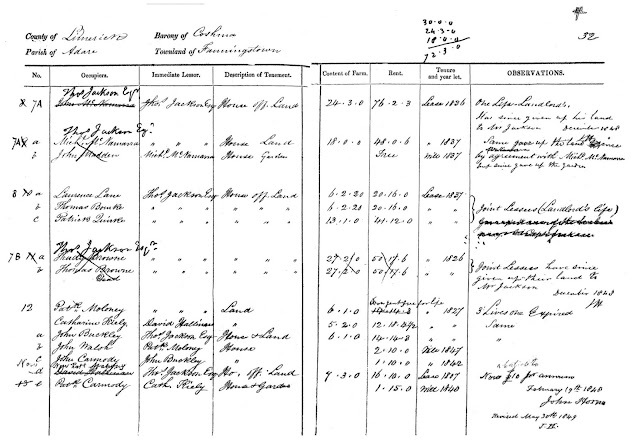 Two houses were longer than those of our family; one being Eliza Hogan’s at 64.6 Feet (although this house is classed as 3B being a poorer quality than the Browne houses) and the vacant house of John McNamara (lot 6a) at 55.6 feet. There were two very small houses. Ellen Kelly’s house measures 23.6 feet by 14 feet. The house for James McCormack measures 18 feet by 11.9 feet with a notation that “this house is raised against a ruined wall. It is so very worthless that I have omitted it in the Poor Law Sheets but left room for it if required. It is only a temporary refuge.” Twenty-five houses were originally valued; five of those houses were destroyed during the survey. 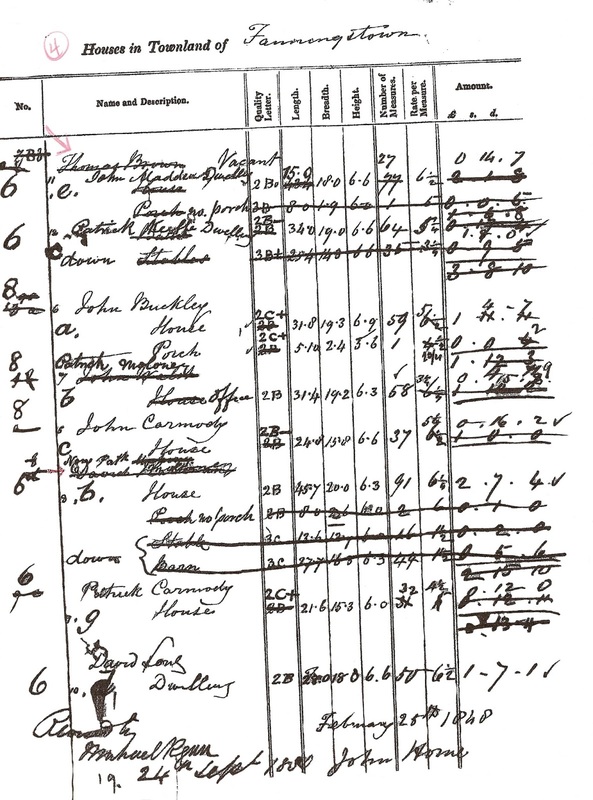 The survey for this area of County Limerick took place during the height of the famine and I believe is representative of what hardships people faced throughout that time. There were evictions, deaths, and emigrations as a result. But our family, like so many others, were survivors and had fond memories of their homeland as evidenced by the stories handed down. Now that we have a good idea of the people in Fanningstown and the houses they lived in, the next post will look at the property and try to actually put them on the map. 1. Browne, Thady, House Book, Townland of Fanningstown, Co. 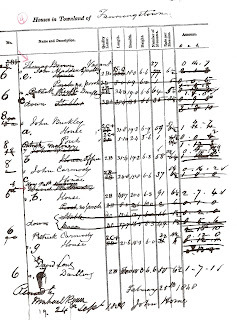 Limerick, dated February 1848 to September 1850, Family History Library, microfilm #2299825, item 25, page 28. The original copy of the microfilm is in poor condition. I tried to clean the copy but there are still areas that are difficult to read. 2. Quality codes were used to value buildings. The codes include both a number, identifying construction materials, and a letter describing the condition of the structure. There may also be a + or a – sign to further distinguish the appearance. Letter “A” indicates the building is new or nearly new; “B” identifies a building that is of medium age (about 25 years old); “C” indicates a building is old. Numbers “1” and “2” indicate a structure of stone or brick with lime mortar; “1” identifies a slate roof where “2” indentifies a thatch roof. Buildings showing “3” are thatched structures with stone walls with mud mortar or mud walls. 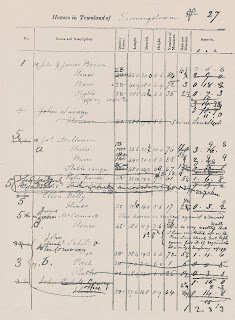 See http://timeline.ie/griffiths-valuation-house-books/ for further explanation of quality codes. 3. Thatched House, Ballymacashel, County Limerick, National Inventory of Architectural Heritage, Reg. No. 21901223. www.buildingsofireland.ie This building shows three chimneys. Thady’s house would probably have had only one central chimney. Exact measurements of the house are not available. When I contacted the NIAH, they estimated the length of the building as it stands now at 59 feet because of the extension of one bay probably in the later 19th century. The NIAH is similar to the National Register of Historic Places in the US. 4. Browne, John and James, House Book, Townland of Fanningstown, Co. 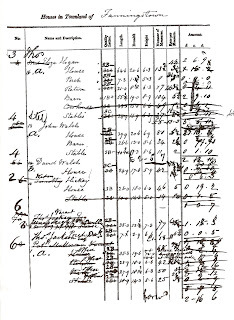 Limerick, dated February 1848 to September 1850, Family History Library, microfilm #2299825.